Healthcare-associated meningitis and ventriculitis are infections that complicate craniotomies, CSF shunt, and drain surgeries. They are distinct clinical entities compared to community-acquired meningitis. Gram-positive cocci like Staphylococcus epidermidis and S. aureus are the most common pathogens, followed by Gram-negative rods and anaerobes like P. acnes. The diagnosis can be elusive as other noninfectious neurologic conditions and neurosurgeries can cause similar clinical and CSF findings. The management of these infections often requires surgical interventions and may need intraventricular or intrathecal administration of antimicrobials, as the organisms can be refractory to IV antimicrobials alone. 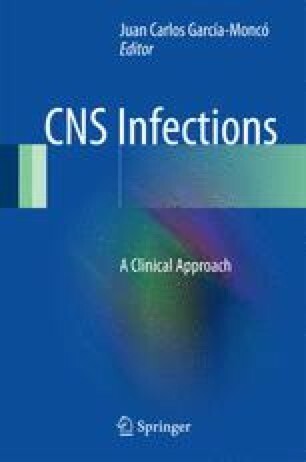 Periprocedural antimicrobials and antimicrobial impregnated catheters have been shown to reduce infection rates. Ng K, Mabasa VH, Chow I, Ensom MH. Systematic review of efficacy, pharmacokinetics, and administration of intraventricular vancomycin in adults. Neurocrit Care. 2014;20(1):158–71. doi: 10.1007/s12028-012-9784-z. Remes F, Tomas R, Jindrak V, Vanis V, Setlik M. Intraventricular and lumbar intrathecal administration of antibiotics in postneurosurgical patients with meningitis and/or ventriculitis in a serious clinical state. J Neurosurg. 2013;119(6):1596–602. doi: 10.3171/2013.6.JNS122126. Epub 2013 Aug 16.